The ReAxis Gas-Piston System by Umarex gives you increased velocity, and more powerful impact. Umarex all metal scope mounting rail keeps scope on zero. Allows both Weaver and Picatinny clamp-style scope rings. Umarex StopShox is a technologically advanced anti-recoil and anti-vibration system that helps to keep your scope zeroed in. The Umarex Throttle is loaded with innovative features that make your shooting experience awesome! 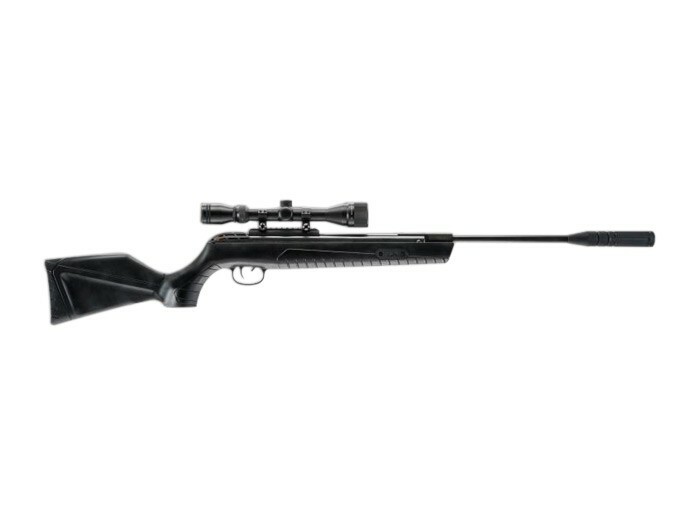 The Throttle air rifle is first in the Umarex lineup to feature the StopShox vibration reduction system. It is designed to absorb shock, vibration, and recoil. The airgun also incorporates the ReAxis gas piston powerplant. Compared to traditional gas piston systems, the ReAxis delivers even more power. Add to that the SilencAir noise suppressor, Umarex LockDown mount, 2-stage adjustable trigger, 3-9x32 AO scope, and the all-weather stock, and you have a winning combination of stealth and power in an affordable package! What others should know: Before I became a Pyramyd Air customer I had purchased a Umarex Octane in 177 Had piston seal problems with two of these rifles. With the problem with this Throttle rifle I am now officially finished buying Umarex Chinese made products. I will stick to the German made Diana/Rws/Walther Umarex products. Thanks to Pyramyd Air for great customer service as always. The main reason that Umarex Octane and Clone air rifles never live up to the velocity hype they're marketed under is because virtually every single one of them is shipped with damaged piston seals. Damaged piston seals means that they cannot produce the optimum pressure they were designed to produce and thereby create high enough pressure levels within the pressure chamber to duplicate the velocities that lead people to buy these air rifles in the first place. I've taken enough of these air rifles apart that I now know for a fact that there is no way to install a brand new piston seal without damaging it as well. This is due to the milled slot on the underside of the receiver. The inside edges of this milled slot has serrated razor sharp corners that could fillet a fish if you slid one into the receiver of one of these air rifles. The irony of it all is that if you send it back for a seal replacement, the replacement seal will be damaged too. Guaranteed! Things I liked: All my rifles are .177. This is the last gun you will need for your collection. I own many air rifles and have been shooting since I was a young boy -- now 40 years later I come across this rifle. Accurate right out of the box. I have been doing a lot of testing at 20 yards with different pellets and found the H&N Baracuda Hunter Extreme 9.57gr works perfect. I usually shoot dome or round nose, but this thing is so accurate with the Hunter Extreme!!! I am litterally popping these pellets one after another through the same hole. Kudos to Umarex!!! You found the right combination that blows all my other rifles away. Things I would have changed: The only things I would change are 1) The safety -- I don't like pulling it back towards the trigger. I think the industry standard, like Gamo and Crosman should have been used. 2) I doesn't look like there is a way to put on a sling -- will probably have to get one of those "tactical fit-alls"
What others should know: This is the best air rifle I've ever purchased. The price still blows me away. Umarex really is a great company and have made the best rifle very affordable. Things I liked: Super quiet with the lighter weight pellets. Extremely accurate right out of the box. Stopshox to put less stress on my scope. Overall just a real nice rifle put out by Umarex. Things I would have changed: The plastic forearm that connects to the barrel. The 4 screws connecting it to the barrel just keep spinning and won't tighten down. It isn't affecting the performance of the rifle at all but it would feel better when I'm moving around with the rifle if the screws would stay tight. Other than that I can't think of anything else that I would consider negative about this rifle. What others should know: I have zeroed in this rifle with lightweight pellets and with heavy pellets and they all perform excellent. I would highly recommend this rifle for anyone. Is there some kind of strap... I would like to shoulder when I go hiking. Has anyone else had the front cocking linkage pivot pin fall out. The pin appears to be grooved for an e-clip but I think I'm gonna just stake it back in place. Funny that the 10 for 10 tech didn't find this. May not bother with that service again if I even decide to purchase from Pyramid.